Dialogo […] del modo de lo tradurre d’vna in altra lingua segondo le regole mostrate da Cicerone. — In Vinegia MDLVI. [Colophon:] In Venetia per Gio. Griffio. Ad instanza di Lodovico delli Avanzi, MDLVI. [Venice, Griffo for Avanzi, 1556]. 8vo (146 x 102 mm). A-G8: ff. 54, (2), G8 blank. Modern, badly executed vellum binding. ¶ Sebastiano Fausto (1502-1565?) 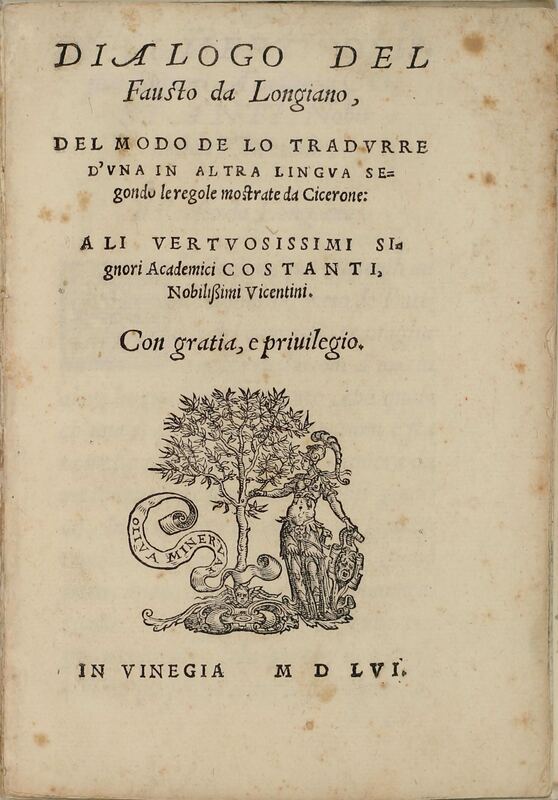 was a professional translator and editor, author of a treatise on education of Erasmus spirit and an annotated edition of Petrarch (1532). He translated numerous works of Cicero, Erasmus, Piccolomini, Aristotle and many others. „The interest of [the dialogue on the art of translating], however, lies in more than its restatement of Cicero’s rules for rhetorical translation […]. Longiano’s treatise appears, then, to make a decisive break with what we have called the disruptive fallacy. Point by point, he has taken Cicero’s brief statement on translation and built it, through gloss and commentary, into a finely structured work not only corrective, but innovative in spirit. The result is a microcosm of the entire translative act with the two subdivisions of the second part summarizing the stages of that act. At the initial level (Argument, Arrangement, Elocution), the Translator is a Reader with all the analytical and perceptual commitments implied in the term; at the narrower level (Composition, Dignity and Number), he transposes these insights, gleaned as Reader, into the speculative function of Writer. Together, the two functions are predicated on a deeper awareness that reciprocity between any two languages is at best relative, sometimes determined by precise equivalencies in morphology and syntax, at other times, by new and transforming patterns of expression. This relativistic credo, in fact, cuts across each topic treated by Longiano, turning his work into an affirmation that where there is no attempt to sort out the articulative potency of language, grasping its inseparability from ideas, there can be no translation“. (G. L. Norton, The ideology and language of translation in Renaissance France and their humanist antecedents, Geneve, 1984, p. 202). See also G. Frasso, Sebastiano Fausto: editore e volgarizzatore di storici medievali e umanistici, in: Aevum, LXIV, (1990), p. 363.